We all know that any meal or drinks can be enhanced by a fantastic view. Luckily, with most of Bristol resting on a ridiculous gradient, impressive views over the city and beyond are not hard to come by. Sometimes though, it’s just nice to sit in a good pub garden and take in your surroundings, whether it be on a river bank, on a busy high street or up a behemoth hill. I wrote a post on the best places to enjoy around the harbour a while ago; but despite it having arguably (and unsurprisingly) the best concentration of bars and restaurants in the city, the harbour isn’t the only place in town to go once the sun shines – so here are some of my tips for the best places to enjoy the fine weather, regardless of where you are in town. Famous for its views over the Avon Gorge and the Clifton Suspension Bridge, this place is a big draw for locals and tourists alike. Pro: The views are unbeatable if you want the wow factor. Con: The terrace is often very busy, so you’ll have to be quick in nabbing a table, or be prepared to share. The terrace at The White Lion – what a view, eh? Half way down Jacobs Wells Road, this unassuming pub leads through to a lovely tiered garden at the back. A veritable magic garden if ever there was one. Pro: The garden is very cute, the ale and cider selection is impressive and their DIY Ploughman’s selection is a thing of wonder. Con: The stairs up to the garden are a tad steep, so it’s not suitable for all, especially the tipsier rogues among you. I need to stop adding this place to every list I produce on this site, but what can I say, these guys do a lot of things right. Pro: Great for people watching, plus the drinks selection and tapas menu are great. Con: You’re sat on the busy Gloucester Road, so things could be a bit noisy. 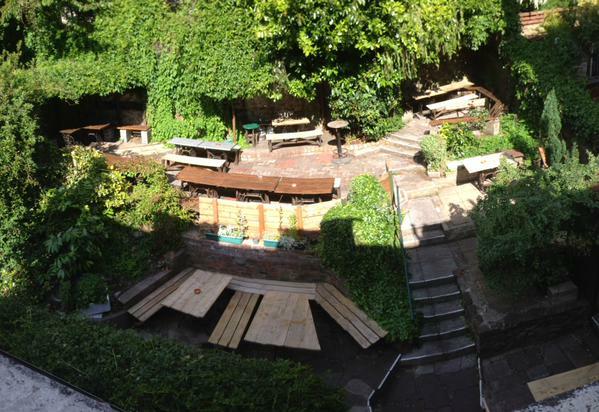 Off a side street in the heights of Redland, this pub manages to sneak in an impressively large garden out back. Pro: Good selection of drinks, usually nice and chilled outside. Con: You’ll have to climb up Redland Hill to get there (unless you’re local, in which case – lucky you). A nice large pub towards the top of Gloucester Road – not only are there plenty of seats inside, but you can also find a pew out the front, or out back in their huge garden, complete with a small playground for kids, and a mini bar & pizza oven (mainly used for their epic beer and cider festivals). Pro: Lots of space, great for families. Con: The garden can get quite noisy on busier days. One of the first places to kickstart the gentrification of Bedminster’s North Street, this is a great place to take the family or meet with friends before a night out. Pro: A big garden with lots of places to sit, tasty and well-priced food, some good events on throughout the week too. Con: Again a very popular choice in the area, so you may struggle to find a space on a busier evening. Situated on the Windmill Hill side of Victoria Park, this pub has a lovely expansive garden which looks over the rolling hills south of Bristol. Pro: Fine views, great drinks selection, and the pub boasts its own pizza oven too! Con: One of the pricier pubs in the area, but then you do get what you pay for, and the pub often has special offers on food. How did we cope without this sunny terrace before? Situated at the bottom of Colston Tower overlooking the centre, this is the perfect spot for summertime fizz in the sunshine. Pro: Huge venue (inside and out) so you can usually find a table. The food is ace too. Con: Service can be a bit slow on busier days. As well as being a lovely local city farm, St Werbugh’s also has an award-winning cafe and a fantastic pub to boot. Well worth a visit to all three! Pro: Family and dog friendly, lovely home cooked food and the garden is a real sun trap. Con: The inside is quite teeny and there aren’t any other places in the immediate vicinity (other than the very lovely St Werburghs City Farm Cafe). Situated on a boat (or barge, as the name suggests) in Hotwells, there is no better place in Bristol for views of the harbour on a sunny day. Pro: Great food, good drinks (it’s owned by Bristol Beer Factory) and a lovely top deck for sun worshippers. Con: Seats are limited, especially on the top deck, so you need to be quick to get a seat on weekends and around dinner time. Tucked away in a side street in Montpelier, this is a very typical pub for the area – think hemp clothing, dreadlocks and nose rings. Pro: Expansive garden, quirky decor, friendly atmosphere. Some fearsome ciders too. Con: The alternative crowd and some of the music events will put some off. A beautifully restored building on Old Market (duh) with an unexpectedly lush roof terrace up top. Pro: Family friendly, great food and plenty of space on that there terrace. Con: A roof terrace rather than a garden, and there’s not much of a view, but it is still a lush place to soak up some rays. A bit of a secret treasure for most Bristolians – a small bar and cafe hidden away in the depths of St Anne’s, overlooking the Avon. Pro: Lovely location on the river, it also has its own cute water taxi! Con: It’s not the easiest place to get to, but it is worth the trek. 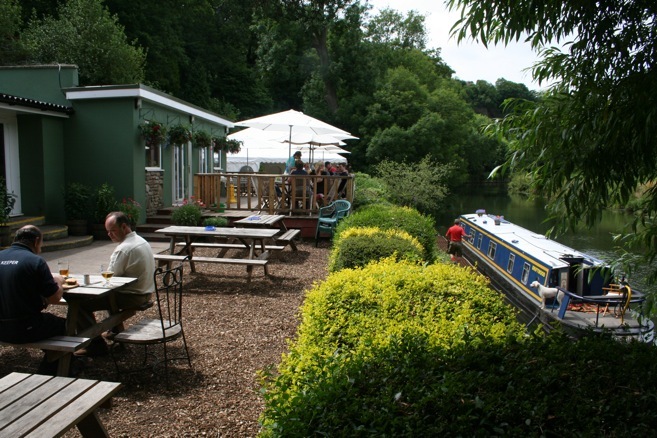 Pleased to say that over the years I’ve been to four of these alfresco eateries — Beese’s, The Cadbury (could hear music from here when we lived in York Road, several back gardens away), The Farm and, once, the Avon Gorge Hotel (though I have no idea what I ate or drank, nor the occasion). All great places, and I’d love to hear tips about other places to try. The Avon Gorge Hotel – one of my favourite places in Clifton! For those dragging tots, The Royal Oak, 385 Gloucester Rd, Bristol, City of Bristol BS7 8TN has a big sun-trap beet garden with a nice playground to keep restless kids occupied while you eat. Nice pub grub too at reasonable prices. Just need this weather to hold now.